Singapore’s founding father Mr Lee Kuan Yew passed away peacefully on March 23, 2015 at the ripe age of 91. He suffered from severe pneumonia and warded in the Singapore General Hospital since February 5. Prime Minister Lee Hsien Loong has declared a seven-day period of national mourning. As a mark of respect, the state flags on all government buildings will be flown at half-mast for the mourning period, which starts on Monday, March 23, and ends on Sunday, March 29. Mr Lee leaves behind his sons, Prime Minister Lee Hsien Loong, 63, and Mr Lee Hsien Yang, 57, daughter Dr Lee Wei Ling, 60, daughters-in-law Ho Ching, 61, and Lee Suet-Fern, 56, seven grandchildren and two siblings. His wife, Madam Kwa Geok Choo, predeceased him in 2010, at the age of 89. Mr Lee’s body will lie in state at Parliament House from Wednesday, March 25, to Saturday, March 28, for the public to pay their last respects. They can do so from 10 am to 8 pm daily during that time. A state funeral service for Mr Lee will be held at 2pm on Sunday, March 29, at the National University of Singapore’s University Cultural Centre. Many world leaders are expected to attend the funeral service, including Narendra Modi, Prime Minister of India. Tributes have been pouring in from world leaders describing Lee Kuan Yew as the architect and builder instrumental in shaping Singapore, a sleeping fishing village a century ago as an economic power house. It took just over five decades to convert Singapore as a mini-super power. There is no gainsaying the fact Mr. Lee leaves Singapore as his lasting legacy. They condoled the death of former Prime Minister of Singapore Lee Kuan Yew, saying that the Thamils across the world have lost a good friend. “He brought together various nationalities—Thamils, Malaysians and Chinese—and made Tamil spoken by a negligible percentage as one of the official languages,” said DMK leader M. Karurunanidhi. PMK leader S. Ramadoss said Lee Kuan Yew always insisted on granting Sri Lankan Thamils their rights and described as ethnic cleansing their killing while Indian leaders sought to portray their struggle as an act of terrorism. “Only a separate country could deliver Thamils from the clutches of Sinhalese hegemony and did not hesitate to call former President Mahinda Rajapaksa as a terrorist,” said Dr Ramadoss. MDMK general secretary Vaiko said Lee Kuan Yew, who had loved the Thamils in his country, had understood the just demands of the Sri Lankan Thamils and drew the world’s attention towards their struggle. “He openly condemned Mahinda Rajapaksa and reiterated that Thamils were the original citizens of Sri Lanka. He also justified the armed struggle of the LTTE on the ground that it was against the majority Singhalese’s attempt to wipe out the Thamils,” he said. Author Thomas Gordon Plate is an American journalist, internationally syndicated columnist and a Professor at Loyola Marymount University in Los Angeles, CA as its Distinguished Scholar of Asian and Pacific Studies. Mr Lee had a grand vision to build and shape Singapore from the time he and his People’s Action Party colleagues pushed for self-government in the 1950s, to their quest for merger with Malaysia in the early 1960s and their efforts to secure the country’s survival after independence that was thrust on it on August 9, 1965. Singapore was founded as a British trading colony in 1819. It joined the Malaysian Federation in 1963 but separated two years later and became independent. Singapore subsequently became one of the world’s most prosperous countries with strong international trading links (its port is one of the worlds busiest in terms of tonnage handled) and with per capita GDP equal to that of the leading nations of Western Europe. There is a system in place of exemplary punishments for acts deemed to be anti-social. According to World Bank (2011 – 2013) by GDP (PPP) Singapore ranked 4th out of 185 countries listed. Only Macau (Int$142,599) Qatar (Int$136,727) Luxembourg (Int$90,410) and Kuwait (Int$88,259) managed to beat Singapore. Nebouring countries like Sri Lanka (98 -Int$9,738) India (124 – Int$5.412) Pakistan (132 – Int$4,602) Bangladesh (148 – Int$2.948) Nepal (154 – Int$2,295) all ranked far below Singapore. Only Malaysia came close to Singapore being placed 47 with Int$23,333 per purchasing power parity (PPP). Unlike many south Asian political leaders, Lee Kuan Yew was a statesman who had a grand vision to build Singapore as a model city state for any other country that aspires to have both prosperity and peace. In 1965, Lee Kuan Yew knew many examples of failed states. So, he avoided racial conflict, linguistic strife, and religious discrimination. In a country which is multi-racial, multi-lingual, multi-religious and multi-cultural, he made Chinese, Malay, English and Thamil (spoken by a mere 4.4% Official Languages) as official languages. Thus, although Chinese dominated the political and economic landscape, there was no discrimination on the basis of race or religion. Again, though Chinese outnumbered the rest of the population by a ration 3:4, there was equality and prosperity all around. And that perhaps is the magic why Singapore became a mini-super power. Unlike Sri Lanka where there were series of racial pogroms beginning from the enactment of Sinhala Only Act in 1956 which became endemic till 1983. 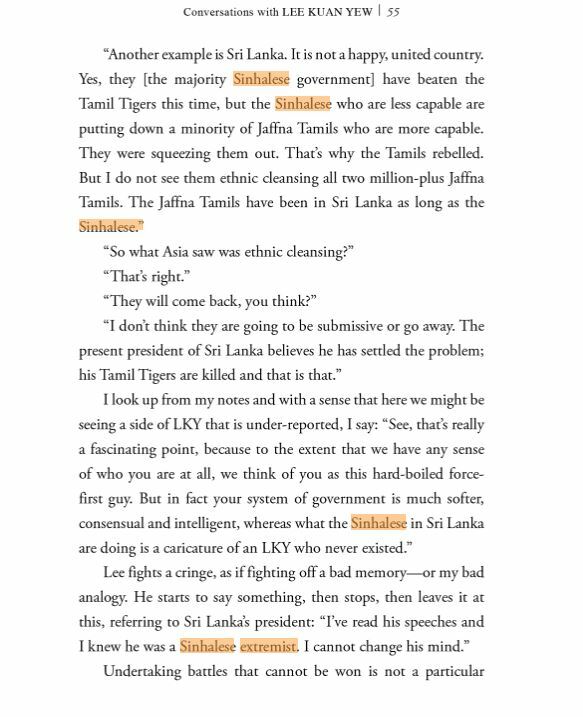 It culminated in a bloody civil war between Sri Lankan armed forces and the Liberation Tigers of Thamil Eelam that lasted for 26 long years tearing the country apart along racial and religious lines. The country is still groping in the dark in terms of ushering in good governance, rule of law, peace and political pluralism. In this respect Sri Lankan political leaders were myopic, visionless, and selfish who sought power at the expense of the country and its people. The unexpected regime change, 2 years ahead of schedule, that took place on January 09, 2015 led by Maithripala Sirisena has raised new hopes after the defeat of Mahinda Rajapaksa’s family dictatorship, cronyism, chronic waste, corruption, undermining of the rule of law etc. The racial and religious tensions that lasted for 67 long years and still continuing although on a subdued scale. A long time ago, Singapore was once known as Sea Town. While the earliest known historical records of Singapore are shrouded in time, a third century Chinese account describes it as “Pu-luo-chung”, or the “island at the end of a peninsula”. Later, the city was known as Temasek (“Sea Town”), when the first settlements were established from AD 1298-1299. During the 14th century, this small but strategically-located island earned a new name. According to legend, Sang Nila Utama, a Prince from Palembang (the capital of Srivijaya), was out on a hunting trip when he caught sight of an animal he had never seen before. Taking it to be a good sign, he founded a city where the animal had been spotted, naming it “The Lion City” or Singapura, from the Sanskrit words “simha” (lion) and “pura” (city). The city was then ruled by the five kings of ancient Singapura. Located at the tip of the Malay Peninsula, the natural meeting point of sea routes, the city flourished as a trading post for vessels such as Chinese junks, Arab dhows, Portuguese battleships, and Buginese schooners. The city’s strategic location of Singapore has made it an ideal trading hub. Modern Singapore was founded in the 19th century, thanks to politics, trade and a man known as Sir Thomas Stamford Raffles. During this time, the British Empire was eyeing a port of call in this region to base its merchant fleet and to forestall any advance made by the Dutch. Singapore, already an up-and-coming trading post along the Malacca Straits, seemed ideal. Raffles, then the Lieutenant-Governor of Bencoolen (now Bengkulu) in Sumatra, landed in Singapore on 29 January 1819. Recognising the immense potential of the swamp-covered island, he helped negotiate a treaty with the local rulers and established Singapore as a trading station. The city quickly grew as an entrepot trade hub, attracting immigrants from China, India, and the Malay Archipelago and beyond. In 1822, Raffles implemented the Raffles Town Plan, also known as the Jackson Plan, to address the issue of growing disorderliness in the colony. Ethnic residential areas were segregated into four areas. The European Town had residents made up of European traders, Eurasians and rich Asians, while the ethnic Chinese were located in present-day Chinatown and south-east of the Singapore River. Ethnic Indians resided at Chulia Kampong north of Chinatown, and Kampong Glam consisted of Muslims, ethnic Malays and Arabs who had migrated to Singapore. Singapore continued to develop as a trading post, with the establishment of several key banks, commercial associations and Chambers of Commerce. In 1924, a causeway opened linking the northern part of Singapore to Johor Bahru. Singapore became a British Crown Colony after the Japanese surrendered. Singapore’s prosperity suffered a major blow during World War II, when it was attacked by the Japanese on 8 December 1941. The invaders arrived from the north, confounding the British military commanders who had expected an attack by sea from the south. Despite their superior numbers, the Allied forces surrendered to the Japanese on Chinese New Year, 15 February 1942. It was the largest surrender of British-led forces in history. The island, once feted as an “impregnable fortress”, was renamed Syonan-to (or “Light of the South Island” in Japanese). When the Japanese surrendered in 1945, the island was handed over to the British Military Administration, which remained in power until the dissolution of the Straits Settlement comprising Penang, Melaka and Singapore. In April 1946, Singapore became a British Crown Colony. Singapore has come a long way to become what it is today. In 1959, the growth of nationalism led to self-government and the country’s first general election. 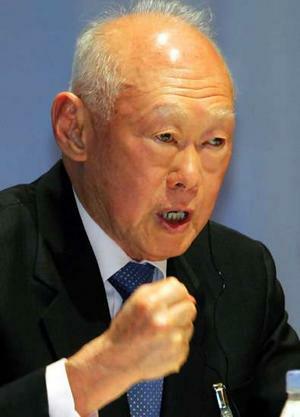 The People’s Action Party (PAP) won a majority of 43 seats and Lee Kuan Yew became the first prime minister of Singapore. In 1963, Malaysia was formed, comprising of the Federation of Malaya, Singapore, Sarawak and North Borneo (now Sabah). The move was meant to foster closer ties. However, Singapore’s merger proved unsuccessful and less than two years later on 9 August 1965, it left Malaysia to become an independent and sovereign democratic nation. Conventional Name – Republic of Singapore. Geographical location – Situated 137 km (85 mi) north of the equator, and just south of Peninsular Malaysia. In south the Strait of Singapore separates the island from the Riau Archipelago of Indonesia. Area – 718 sq km (277 sq ml). Country comparison to the world: 192. Because Singapore lies just north of the equator, the wet tropical climate has no clearly defined seasons. The average annual temperature is 27°C (81°F) and the average annual rainfall is 2,400 mm (95 in). From north to south Singapore Island, the main island extends 22 km (14 mi), and its greatest east-west extent is 50 km (31 mi). The city-state consists of the island of Singapore and about 54 smaller islands. The main island is linked by a causeway to the southern tip of the Malay Peninsula. It is slightly larger then one fourth of Luxembourg or 3.5 times the size of the District of Columbia, Washington, DC. Industries – electronics, chemicals, financial services, oil drilling equipment, petroleum refining, rubber processing and rubber products, processed food and beverages, ship repair, offshore platform construction, life sciences, entrepot trade. It is said the difference between politician and statesman is a politician thinks of the next election and the statesman thinks of the next generation. Lee Kuan Yew thought about not one but three generations ahead when he came to power in Singapore. Thus, he proved himself a statesman and not a politician. It is also claimed he wanted to develop the young city state modelled like Sri Lanka. However, history turned the comparison on its head. Today, where is Sri Lanka compared to Singapore? Singapore is a dream comes true. That is a lesson to be learnt by politicians of third world countries, especially Sri Lanka. Do Fish Drink Water – Does Nepotism Matter?